SA Express is losing more than R1 million a day, paying leases on aircraft that lie idle in hangars because they are too unsafe to fly. In the week that Finance Minister Tito Mboweni announced a R1.2 billion bailout for the sinking state-owned airline, five senior aviation sources close to SA Express management told City Press that in the five months since it was grounded, the company has paid about R150 million to lease 21 aircraft. About R80 million of that was used to pay for 13 aircraft which have not flown for five months. Most of them may never fly again because they are scrap, the sources said. As President Cyril Ramaphosa secured more than R290 billion in investment in the country’s ailing economy on Friday, many millions of rands are being drained out of it – mostly by state-owned entities. SA Express is the latest in a string of government companies draining billions from the fiscus through bailouts and guarantees. On Wednesday, Mboweni announced a R5 billion bailout for SAA in addition to the R1.2 billion bailout for SA Express. Last month, City Press reported that SAA was considering selling off assets as its debts outstripped what it owned by R15 billion. In May, the Civil Aviation Authority (CAA) grounded SA Express’ entire fleet after a safety audit uncovered “severe cases of noncompliance” which posed “serious” safety risks to its passengers. City Press has calculated that in June and July, SA Express paid about R50 million to lease its 21 aircraft, none of which flew a single flight in those two months. At the end of July, the CAA granted SA Express airworthiness certificates for two aircraft. And by the end of last month, the regulator authorised the airline to fly eight aircraft. Two of the sources said this meant that the amount of money that SA Express was paying for “scrap aircraft” sitting in the hangars between August and the end of this month was estimated at R40 million. A senior aviation source said: “SA Express does not own any aircraft. They are leasing all those aircraft. It simply means that whether they are flying or not, they have to pay for those lease agreements. “Since they were grounded, they have been paying for aircraft that they are not able to fly. The sources said SA Express was sitting with a dilemma in that, when it was grounded in May, the officials had to “cannibalise” some of the aircraft in order to get others back in the air. “Lease contracts in the aviation sector are done in such a way that at the end of the agreement, the lessee has to return the aircraft to the owner in the condition in which it leased them,” said one. “But now SA Express cannot do anything with the 13 scrap aircraft. They can’t fly them because they are not airworthy. They can’t fix most of them because they don’t have the money to do so. In addition, a portion of the lease payment is set aside for maintenance – but SA Express’ poor finances have meant that it needed to dip into that money, which is now no longer available for maintenance. A senior executive at SA Express’ sister company SAA said the troubled parastatal was “paying for aircraft that are not generating revenue”. “That is bad for business. The situation at SA Express calls for hard bargaining and aggressive commercial negotiations,” he said. “The executives there have a few options: Get those aircraft back in the air as soon as possible, or negotiate themselves out of those lease agreements. They can go to the lessors and ask them to take back their aircraft, end the agreements and take the penalties. “They can also look at the scrap aircraft’s book value, buy them and write them off,” said the senior SAA executive. A former acting SAA chief executive said he was well aware of the problems at SA Express. “I am not sure if they will be able to repair all the aircraft on the ground to the point where they are able to fly again. It is unlikely that they will be able to return all of them back to air,” he said. The airline has also not presented its latest financials to Parliament, which it should have done by the end of September, because its books are in shambles. 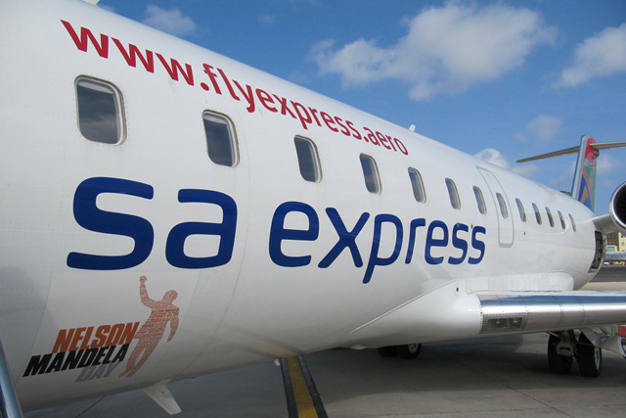 The SA Express fleet consists of 10 Bombardier Q400, eight Bombardier CRJ200 and four Bombardier CRJ700 aircraft. A managing director at one of SA Express’ competitors, who benefited from the airline’s grounding by capitalising on its unserviced routes, said the R1.2 billion bailout that Mboweni announced this week was not enough to haul the state-owned company out of the woods. “The R1.2 billion will help address historic debt, but it is not enough to take the business forward,” he said. The government has two options: put more money into SA Express or shut it down completely, he added. The senior SAA executive agreed that Mboweni’s bailout was insufficient, and said government should rather close down SA Express and acquire a larger stake in private airline SA Airlink. “SAA already has a 4% stake in SA Airlink, and if we buy a bigger stake in the company, we could use it as a feeder airline for SAA not only in the country, but also across the region,” he said. South Africa’s aviation sector, the SAA executive said, would only survive through strategic acquisitions, alliances and partnerships. Another former executive at SAA agreed that SA Express was an unnecessary drain. “Is SA Express fit for purpose? The answer is no. It has been struggling to make money, even when it had no serious competition,” he said. Another highly placed aviation source said taxpayers should brace themselves for the state forking out another R2 billion in bailouts for SA Express – because the banks have refused to lend the airline more money, despite a R1.74 billion government guarantee announced by Public Enterprises Minister Pravin Gordhan in August. SA Express spokesperson Madikwe Mabotha said the airline had made significant progress since it was grounded in May. “Returning from three months’ lay-off to full operation was never going to be easy,” he said. “The grounding created a huge market gap in the industry that quickly opened up an opportunity for our competitors to exploit. “So far, SA Express has relaunched a total of seven major local and regional routes, focusing on destinations with profitability potential by offering improved frequency at timings that suit our customers. Mboweni’s R1.2 billion bailout would help the company settle some of its debt and return to financial stability, Mabotha said.